The Doctor Who LEGO Set is Retired: What Does This Mean, and Where Can You Still Find It? 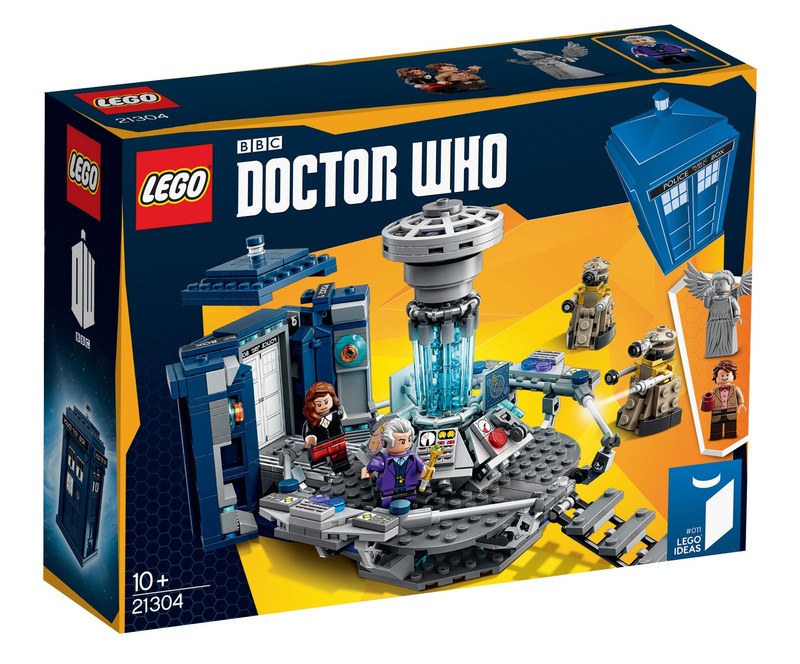 You might recall the excitement in 2015 when LEGO announced its first Doctor Who set: this was a design featuring the latest TARDIS interior. 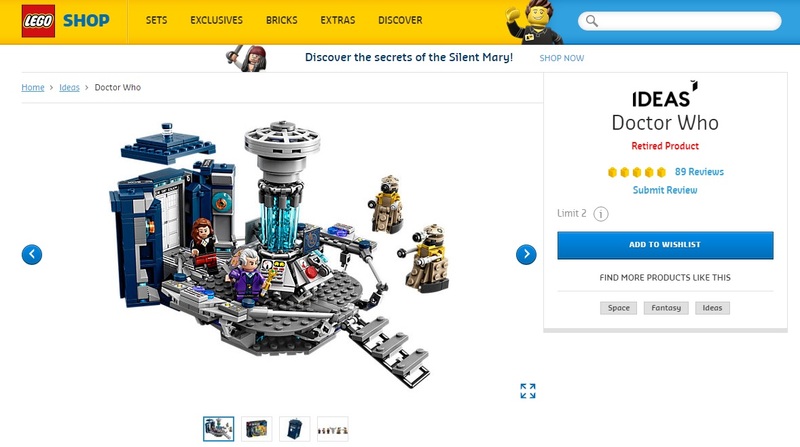 But that set is no longer available on the official site, or indeed in LEGO shops. Based on The Time of the Doctor, the pack included the TARDIS interior and exterior, two Daleks, a Weeping Angel, Clara Oswald, and two Doctors – the Eleventh, with his tweed Series 5-7a look, and a newly-regenerated Twelfth, still in the Eleventh Doctor’s Series 7b outfit. Obviously, you can take the Twelfth Doctor’s head off and replace it with the Eleventh’s too. Check out the LEGO site, however, and it’s recently become retired. LEGO generally only do a set for a limited time only – this is essentially like most licensees (arguably apart from books, which get reprinted from time to time), except LEGO make a bigger deal of it so they can sell more before production ends. That’s fair enough; it’s down to the individual sets’ popularity to determine how long something stays relevant, and nearly two years is pretty good going. Sets based on Marvel and DC Comics, for instance, generally have about a year before retirement, and the same goes for Star Wars, aside from a few exceptions. And look how popular those franchises are! It also ensures more space and money for new ideas. You can’t argue with that. The problem for Doctor Who fans is, there are very few LEGO products available based on our beloved show. Take a look, and you’ll only see that TARDIS set, plus LEGO Dimensions and its expansion packs. Rubbish, eh? The original set came into production via LEGO Ideas, a neat section of the site which allows people to design products and, after getting the expressed support of 10,000 members, get them reviewed by an official Board to determine whether they should actually enter production. 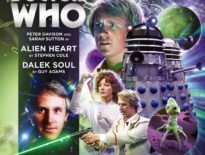 A great notion, except right now, there are no other Doctor Who projects in the works (or at least, none that the DWC could find). They’ve all expired, so didn’t reach Review Board stage in their allocated times. Sadly, nothing has been announced, so perhaps that TARDIS set is the sole one that’ll be made. LEGO already knows the show’s popularity and potential, having included it in the aforementioned Dimensions video game. Maybe we’ll see another project, but it’s not looking likely, I’m afraid. So where can you find the 625-piece TARDIS set, Item #21304? You have to explore unofficial avenues – so anywhere apart from the LEGO site. You can still find it at a reasonable price from most retailers – including Amazon, which currently has it cheaper than it £49.99 RRP. A few branches of Forbidden Planet might still have stock somewhere, but you’ll have to be lucky. Some independent stores will also have it, so keep an eye out wherever you go. The other notable place to go is, of course, eBay, though naturally, you’re risking questionable postage and packaging. Right now, prices are good, but careful you’re not buying a fake copy, an already-built copy (unless that’s what you’re after), or just a minifigure. At any rate, with the product retired, prices will increase and stock will dwindle, so get your hands on it while you still can! Have you got the LEGO set? What do you think? And what further ideas would you like to see? 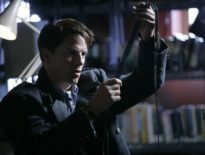 Merchandise	Torchwood Series 5 Announced from Big Finish!